How Does B12 Affect the Menstrual Cycle? Vitamin B12, also known as cobalamin, is an important nutrient that can be found in foods like eggs, meat, and fortified cereals and dairy products. Once consumed, this nutrient is stored in the liver. Vitamin B12 helps the body form red blood cells, produce cellular energy and synthesize DNA. The menstrual cycle of women, which involves blood loss, and vitamin B12, which helps the body synthesize new blood cells, are consequently closely related. Each month, women typically lose about a third of a cup (80 milliliters) of blood during the menstrual cycle. However, it's possible to have far less blood loss or far more — even an entire cup’s worth. During and after a menstrual cycle, women’s bodies have to create new red blood cells. Several vitamins and minerals help with this, particularly vitamin B12, folic acid and iron. 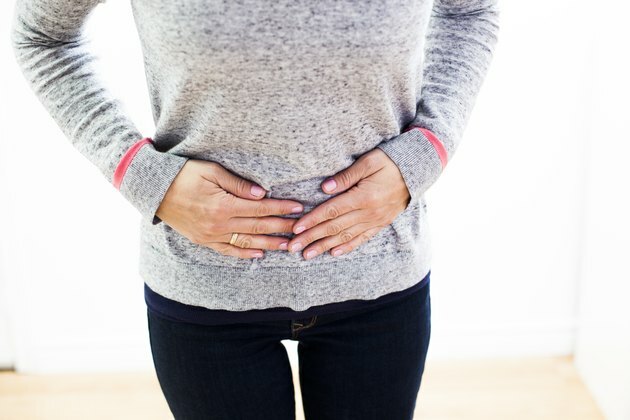 These nutrients are especially important for women who experience heavy periods. Besides helping to produce new red blood cells, vitamin B12, in combination with omega-3-rich fish oil supplements, can actually help women who are experiencing symptoms of menstrual discomfort, or dysmenorrhea. It's important to consume vitamin B12 throughout life. As adults, most women need to consume 2.4 micrograms of vitamin B12 per day. Too little of this vitamin will result in a deficiency. Vitamin B12 deficiency signs may include soreness of the mouth or tongue and issues with balance and memory. People who are vitamin B12 deficient may also experience confusion, depression or anemia. Women may be more likely to develop anemia following blood loss, such as from the menstrual cycle. Vitamin B12 and menstruation are particularly important because of a type of anemia called pernicious anemia, or Biermer's disease. This type of anemia is caused by an inability of the body to absorb sufficient amounts of vitamin B12. If you have pernicious anemia, you'll have more trouble creating new blood cells and will require vitamin B12 supplementation. Without extra vitamin B12, the combination of <ahref="https: www.livestrong.com="" article="" 350552-iron-deficiency-anemia-menstruation="" "=""> </ahref="https:>pernicious anemia and menstruation could be dangerous and have long-term consequences. Vitamin B12 and periods are also known to be related in another way. Insufficient vitamin B12 may cause menstrual problems or the possibly the absence of menstruation entirely. Females who are vegans or strict vegetarians and those who avoid meat products are at increased risk for vitamin B12 deficiency. However, lack of vitamin B12 isn’t the only nutrient deficiency that can affect your period. Menstrual cycles may also be altered by low levels of other vitamins, such as vitamin E, as well as by insufficient calcium or magnesium. Regardless of your choice of diet, be sure to get all of your essential nutrients to avoid deficiencies and their consequences. If you think you're deficient in vitamin B12 or another nutrient, talk to your doctor before you start taking supplements. What Are the Signs and Symptoms of Anemia in Women?